Looking across a kraal at Yakwach towards a young girl milking a cow with large horns. Beyond are the cattle byre (luak) and huts as well as two tall posts, possibly household shrines. Men were forbidden from milking unless no women or children were available, such as on a journey and the task was one of the most important of female household tasks. Note on print reverse ms pencil - "43 4 A92" & print front border ms ink - "NUER X/42"
Morton, Chris. 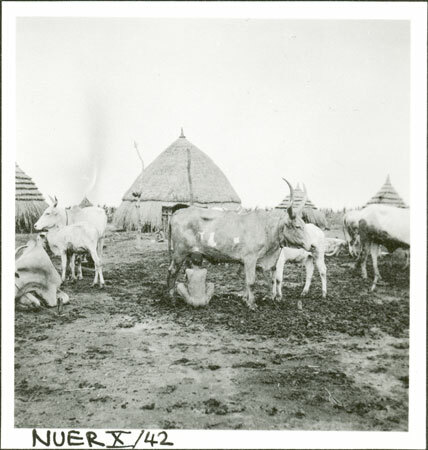 "Nuer girl milking" Southern Sudan Project (in development). 03 Jan. 2006. Pitt Rivers Museum. <http://southernsudan.prm.ox.ac.uk/details/1998.355.469.2/>.